Approved May 27, 1998; constitution amended June 6, 2017 and by-laws amended May 17, 2006, May 8, 2013, and May 3, 2018. Section 2:- The Association shall comprise the communities of Brookdale, Orchardale, and Wohlshire, as defined in Article II. Section 1:- The object of this Association shall be to stimulate interest in and to devise and implement ways and means for promotion of civic and general welfare of the communities in Montgomery County, Maryland, of “Brookdale,” “Orchardale,” and “Wohlshire.” The Association shall be strictly non-partisan and non-profit making in all its activities. The Association may not make political contributions. It shall seek to cooperate with Montgomery County and State of Maryland officials and with other civic associations of like purposes to promote the best interests of its membership and communities. Section 2:- The geographic boundaries of the Association’s region are shown by the map in Appendix A. 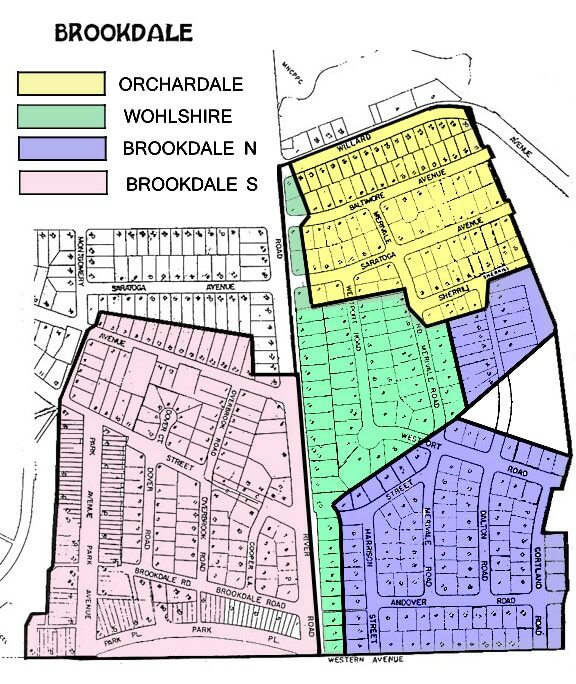 For organizational purposes, the region of the Association is composed of four areas described in Appendix A, which are called Brookdale North, Brookdale South, Orchardale, and Wohlshire. Section 1:- Any adult person (i.e., over eighteen years of age) who resides within the region defined in Appendix A shall be considered a member of the Association. Section 2:- Dues shall be assessed by property and not by member. Any member who resides in a property for which the dues have been paid, as required in the By-Laws, shall be considered a member in good standing. For purposes of all Association business, each member in good standing is entitled to one vote. Section 1:- The Association shall be organized as follows: a) The Elected Officers; b) The Delegates representing the Association in other civic organizations; c) The Area Liaison Representatives; d) Special Committees as may be appointed for specific tasks. Section 2:- The elected officers of the Association, who constitute the Executive Committee, shall be a President, four Vice-Presidents representing each area identified by Appendix A, a Secretary, and a Treasurer. As an option annually, upon recommendation of the Nominating Committee defined in the By-Laws and approval by majority vote of the members, one additional person may be elected as a representative at large. Section 3:- There may be delegates appointed to civic organizations, when determined appropriate by the President. Section 4:- Each Vice President shall appoint Area Liaison Representatives to assist in activities and concerns of his/her area. In all such instances, the President is responsible for co-ordination and determination of prescribed action. Section 5:- Special Committees shall be appointed for special tasks when determined necessary by the President, the Vice President(s) involved with the assent of the President, or by a majority vote of the members present at a meeting of the Association. Section 1:- The duties of the President shall be: a) To act as the Chief Executive Officer of the Association; b) To call and preside at all meetings of the Association; c) To call and preside at all meetings of the Executive Committee; d) To appoint all delegates and alternates to represent the Association in other civic organizations; e) To co-ordinate the action required by the area Vice Presidents; f) To appoint Committee Members of all Special Committees; g) To enforce the Constitution and By-Laws of the Association. Section 2:- The duties of the Vice Presidents shall be to act as principal assistants to the President in the discharge of all his/her official duties with special responsibilities for the respective area represented and all other duties as may be assigned by the President. The President shall designate a Vice President who shall have the authority of the President under Section 1 during the President’s absence or inability to act. The inability of any Vice President to appropriately perform his/her duties shall be cause to declare his/her office vacant and require the vacancy to be filled by an area election or Presidential interim appointment until the next annual election. Section 3:- The duties of the Secretary shall be to maintain and safeguard the records of the Association and maintain membership records, mailing address, and Owner/Renter names; to keep a correct record of its proceedings; to prepare minutes of meetings of the Association and of the Executive Committee; to conduct correspondence as required; to issue notices of all meetings to all residents. Section 4:- The duties of the Treasurer shall be to receive, keep an accurate record of, provide for the safekeeping of, and to disburse all money and funds of the Association. The Treasurer is authorized and will be the sole custodian of a Petty Cash Fund of not to exceed fifty dollars ($50.00) to defray minor administrative expenses of the Association. All other funds of the Association shall be deposited in accounts selected by the Executive Committee. All withdrawals from the bank account(s) of the Association shall be signed by the Treasurer and countersigned by the President or a Vice-President in the absence of the President. Expenditures in excess of $2000 shall be made only when approved by the majority of the members present at a meeting of the Association. The Executive Committee may authorize the expenditure for any single item up to and including $2000. The Treasurer shall submit a report at the annual meeting of the Association, accounting for the income and disbursements for the preceding year. The Treasurer may be called upon for a similar report at any special meeting of the Association. Section 5:- The duties of the Executive Committee shall be to represent the Association in all matters affecting its interest and to have general supervision of and full power to control the affairs of the Association during intervals between meetings, unless otherwise specified. The Committee shall meet at the call of the President or when a majority of the Committee requests a meeting. An affirmative vote of five members of the Committee shall be necessary to take action in the name of the Association at such meetings. When the Executive Committee takes a position on any substantive issue affecting the Association, it shall announce that action to the Association membership in a timely manner. In making a public statement, any officer of the Association may identify him/herself as such only if his/her statement is consistent with positions taken by the Association or Executive Committee or if he/she makes it clear that he/she speaks as an individual, not for the Association. Section 6:- The duties of Delegates to any civic organization shall be to attend meetings of such organizations, represent the Association at these meetings to the best of their ability, and to report to the President or the Executive Committee any matter believed to be of interest or concern to the Association. Section 7:- The duties of Area Liaison Representatives shall be to assist the officers of the Association, upon request, in matters which require close contact with individual members. Such matters, generally, will include those which, because of the need for expeditious action, do not allow time for a meeting of the Association or, because of their minor nature, do not require such a meeting. Tasks which shall be performed upon request, without being all-inclusive, are: communicating between the Executive Committee and the members of the Association, reporting to the Secretary and Treasurer the arrival of new residents and acquainting these families with the purposes and organization of the Association; canvassing for the collection of annual dues or special assessments. Section 1:- The organizational year shall be from June 1 through May 31. Starting January 1, 2018, the fiscal year shall be from January 1 through December 31. Section 1:- This Constitution may be amended by a vote of two- thirds of the members in good standing present at any meeting, provided the membership has been given due notice as defined in the By-Laws of the intent to consider such proposed amendment. Section 1:- Dues shall be $30 per fiscal year per property. Payment shall be made to the Treasurer on or before the first day of June in each year; new members shall pay the full annual fee regardless of the date of becoming a member. Section 2:- Assessments for necessary purposes may be made against each property during any Association fiscal year provided such assessment be ordered by two-thirds of the vote at any meeting defined in Section III and provided due notice has been served to order such a vote. Section 1:- There shall be one (1) annual meeting of the Association each year. It shall be held during May on a date set by the President. The Secretary shall give due notice of the date and agenda for such meeting. Section 2:- Special meetings may be called whenever the President deems it necessary or shall be called by the President upon the written request of ten members, provided due notice be sent to all members. A special area meeting may be called by the area Vice President on matters of a local nature and with the approval of the President provided that procedures comply with the Association interests. Section 3:- No regular or special meeting shall be conducted without a quorum. A quorum shall consist of 30 members in good standing present. Section 4:- When any actions are taken, “Robert’s Rules of Order, Revised” shall govern the proceedings of the Association, unless otherwise specified. Section 5:- Any officer or Chairman of a Committee who is absent from four consecutive meetings without giving notice prior to the fourth meeting to some member of the Executive Committee shall be deemed to have resigned from his/her position and (1) the President shall appoint a member to the vacancy when a chairman is involved and (2) an election shall be held at the next meeting when an officer is involved. Where prior notice is given, it shall be necessary to state the reason for the absence. If such reason is not considered sufficient by a majority of the whole Executive Committee, the office shall be considered vacant and the procedure outlined above shall be followed to fill the vacancy. The word “meetings” as used in this section shall be considered to include the annual and special meetings of the Association and meetings of the Executive Committee. “Due notice” of an annual or special meeting of the Association shall require written notice to all Association households at least 14 calendar days before the time scheduled for the meeting. Section 1:- A Nominating Committee consisting of four (4) members shall be appointed by the President not later than two weeks before the Annual Meeting, to nominate candidates for the elective offices for the following year. No more than one member of the Nominating Committee may concurrently hold elective office in the Association. The Nominating Committee is to be comprised of one representative each of Brookdale North, Brookdale South, Orchardale, and Wohlshire. This Committee shall submit its list of candidates at the annual meeting. Nominations for any elective office may also be made by any member from the floor at this meeting. With the exception of President, nominees from the floor must be made by members from the areas involved. The candidate receiving the largest number of votes cast shall be considered duly elected to the particular office. In case of tie for a given office, additional balloting shall continue until one candidate receives a majority. Section 2:- All officers must be resident members in good standing. Vice Presidents must reside in the area they represent. Section 3:- The elected officers shall hold office for one year beginning June 1. The person holding the office of President shall not succeed himself more than three times consecutively. Section 1:- Special committees and their chairmen may be appointed at any time by the President or by the presiding officer at any meeting, to serve at the pleasure of the President. Section 2:- The President shall be an ex-officio member of any special committees. Section 1:- These By-Laws may be amended by a majority vote of the members present at any meeting, provided the membership has been given due notice of the intent to consider such proposed amendment.